You should use real camera for showing ingame stuff. It's very slow this way. The chat is great.It would be cool if you can add some sort of a code that converts text to other colors. In Call of duty it was ^(number 0-10=every number different color)-here you write your text.The code you write is not part of your name,it disapers and only what you wrote is shown,with different color of course. It's a test man, they're showing that it's functional, designs come in later. many people don't seem to know how mmo works Lol. I said what is obvious,and remembered how it was in cod2. Chat is chat whenever type of game you have. Also the team seemed really professional,but this isnt.The most crucial thing for people to notice you is post only those updates that look good,show progress.Being all slow is a -.Just because it was possible to make it better,and they didnt. This does show progress, I have no idea what you're talking about. The point of the video was to show that global chat is in fact working and that's what they did. I don't how this "isn't" professional or how this update isn't showing progress..do you know how long it takes to make a server? forever, so the fact that they got that done is a big update, especially considering that it's global. there is no use for pretty colors and all the dings and whistles that make it look good if it isn't functioning. Do you want to see this stuff or not. If not I won't bother filming all this stuff for you guys. It save,s me a lot of time. it's not that we dont want to see progress images,videos. It's just when someone suggests something that is going to improve what you show,YOU ACCEPT IT. Acutally, they are showing a chat server. The game server which is what's important is most likely not finished yet. Good Work :) I hope the next video will show some hand to hand combat . 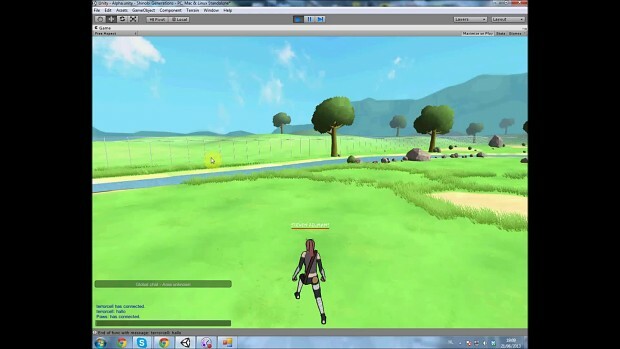 This video shows the progress for the global chat system that we had to develop from scratch. The server location is in Europe.